Household cleaning brand Arm & Hammer has been around as long as baseball, but parent company Church & Dwight is only now getting around to aligning it with Major League Baseball. 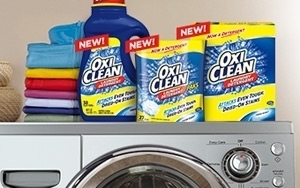 The company has finalized a multi-year partnership with the League to tout the brand and sibling OxiClean. The agreement makes the two brands “The Official Laundry Detergent and Stain Remover of MLB.” It is also the largest sponsorship deal to date for Church & Dwight. The partnership also gives the two brands exclusivity within their categories. Church & Dwight says it will activate against the partnership with national, co-branded TV advertising during games; digital and print advertising and content; co-branded product packaging and point-of-sale elements; and on-site brand activity at specific ballparks throughout the regular season, and at MLB events, including the All-Star Game and World Series. Also on deck is also a national consumer sweepstakes offering MLB merchandise, game tickets and a new car for grand prize. in additionally, Church & Dwight says it will offer licensed products in the Oral Care category. The deal also involves partnerships with the New York Yankees, Minnesota Twins and Cincinnati Reds. The timing is good as the partnership comes after MLB has signed eight-year TV deals with Fox, ESPN and TBS. Also, Tim Brosnan, EVP of business for MLB, tells Marketing Daily that last year, 74 million people attended games, and the past 10 seasons have been the ten best for attendance. He adds that the past eight years have also seen revenue records get broken. The League says ratings have been up for for all "Jewel" including the All-Star Game as well as every round of the post season. Jim Craigie, CEO of Princeton, N.J.-based Church & Dwight, says the biggest on-site and media activations for Arm & Hammer and OxiClean will for the All-Star Game, with a major presence post season as well. "Our presence at the All Star game will be our biggest for any event we've done," he says. He adds that while the MLB deal is a first for Arm & Hammer, which was founded in the mid-19th century in New Jersey, where (and when) baseball was first played, it is not the first baseball deal for the cleaning brand. Two years ago, the brand inked a sponsorship deal with Minor League team the Trenton Thunder, a Yankee farm team, and also grabbed venue sponsorship of the Trenton stadium where they play now, Arm & Hammer Stadium. Brosnan says the MLB deal is exclusive and that's pretty much how the League rolls when it comes to sponsorships. "What we expect from partners, and what Arm & Hammer delivers, is all-in commitment to the sport," he says. "They are our national partner with national titles, and they are committed on a local basis with the clubs. There is a significant marketing spend, and we also don't discount the importance of what they are doing in the aisles of grocery stores, drug stores [and other channels]. We don't desire one-off partnerships and we gave them exclusivity because they gave us the commitment we expect." Fifty to 60% of women buy Arm & Hammer, notes Craigie. "Really, both brands are great icons; and both cover all age groups." According to the ESPN Sports Poll, MLB is the most gender-balanced of the major sports, with 46% of baseball fans being female.